FRIDAY POST ~ Welcome to you very creative artists, poets, photographers and all. In trying to simplify my life a bit more, I have combined my painting with my haiku and photography. Wishing you a loving and simple weekend. QUOTE FOR THE DAY: 'Live simply, so others may simply live.' ~ Quaker saying. lovely haiku on religion. loves the connection between nature and religion. Awesome Haiga Carol ... really a nice one on religion ... nature's our religion I think as haiku poets (smiles). Beautiful haiku, as usual! And I really like that Quaker saying. Happy Friday! Your classical haiku is a treasure, Carol, as usual; so deep, so spiritual. Again, it sounds beautifully, real...religion, within...without. I think religion and beautiful nature are as one. It is sort of a religion, isn't it? I mean, we do this weekly, almost without fail. We honor the experience and the people that have become friends through a special kind of cyber relationship. Natural, like Nature, a miracle in and of itself. Lovely. And what a wonderful religion it is!!! Lovely words! I do love the combination,Carol. I love the Asian simplicity of your paintings, and always love your Haiku, too. I could really use some life simplifying, too! Thank you so much for your comment on my PPF post today. I also enjoy the little pieces of wisdom along the right side of your post. Love the Asian influence. :)Beautiful! Very beautiful! I love your soft colors. Hi Carol and ArtMuse. Hope you are doing well. Love your Haiku. Looks great as a card. Nicely done. Thank you. Your haiku is WONDER-FULL Carol!!! What a wonderful haiku Carol and the soft colors of the painting are soothing to the soul. Happy PPF! Happy Friday and a smooch to Art Muse Dog too! I like this simplification very much... just like haiku, saying so much with just a few words and the beautiful strokes of your brush... yes, this way of being is precious... thank you dear Carol! LOVE your Haiku and the art. Simple is best. Lovely haiku this morning, Carol. May your weekend be full of simple pleasures. 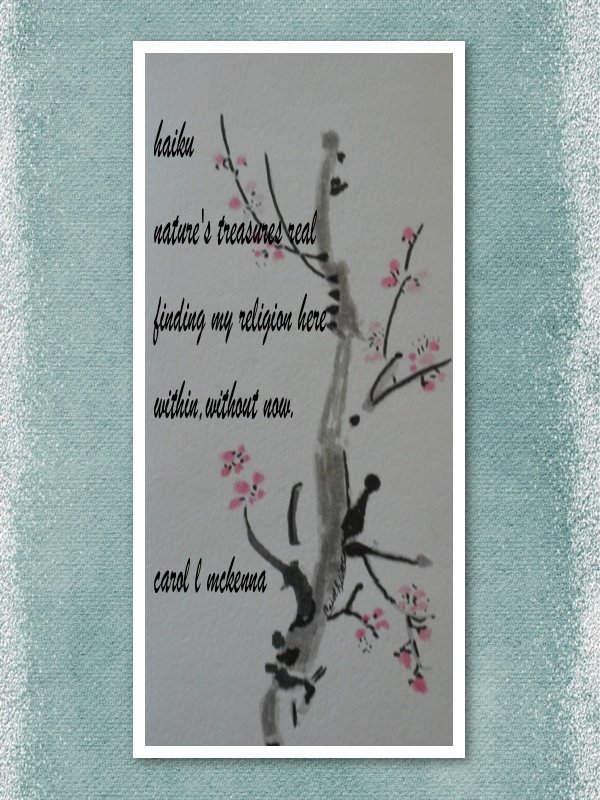 I love the brush painting with the lovely haiku! Loving the quote for the day - Have a great weekend the both of you. Nature--so beautiful and centering--nice capture. love your Haikus combined with your lovely sketches! Wow, Carol, this is gorgeous. It would fit well in my living room with all the mementos my dh brought to me from Japan. Please explain what a haiku is. According to Wikipedia it is a 17 syllable nature poem with 5 syllables in line one, 7 in line two, and 5 in line three. Is this your understanding? so elegant. i love the muted grays and pinks together! How lovely to combine your painting, poetry and photography! Brilliant! What a beautiful haiga Carol! So very beautiful Carol...always a joy to visit..gorgeous poetic words and imagery to match! Such a beautiful and soft image. So lovely. Awesome haiku and love our Japanese style painting, it's delicate simplicity. Poetic words and art ,delicate in their simplicity but still touch our hearts. Really enjoyed the poems will keep on keeping on as I say. not sure the previous comment went through.. I was just wishing you a great weekend!